Christmas Ornaments Made in USA - 2008 Mount Vernon Virgin Mary Ornament - A Christmas Ornament Co. 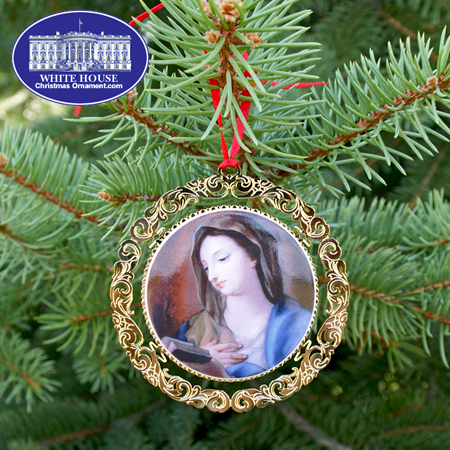 The White House Ornament Collection presents The 2008 Mount Vernon Virgin Mary Ornament. In November 2003, when a group of descendants of John Augustine Washington III came to Mount Vernon, one family member brought with her a photograph of a work of art in her possession. It was a beautiful pastel of the Virgin Mary, a painting that the Washington's hung in the mansion’s large dining room. Now, more than 200 years after George and Martha’s deaths and a voyage through several generations of this distinguished family, the Virgin Mary returned home just before Christmas 2003, through the extraordinary generosity of Maud T. Drane, a great-great-granddaughter of John A. Washington III, the last private owner of Mount Vernon. It is believed that the pastel dates to the 18th century and is possibly a copy after the work of the Venetian artist Rosalba Carriera (1675-1775). It is uncertain as to how the pastel originally came to Mount Vernon, but in whatever fashion the Virgin Mary came to be owned by George and Martha Washington, it is evident they treasured it by its placement in the “New Room”, the most important and public space in their home. It is a testament to the stewardship of the Washington family that they preserved the pastel for so many generations.